Are you looking for some very easy, fun activities to do with the kids for New Year's Eve? Here are 2 that I posted last year. Just click on the links to go to my posts. ~ Make a New Year's Eve Noisemaker! ~ Make a New Year's Eve Clock! ~ Plus here are some great ideas from Deb Chitwood at Living Montessori Now for New Year's Eve and the beginning of the New Year. Here is another awesome GIVEAWAY! 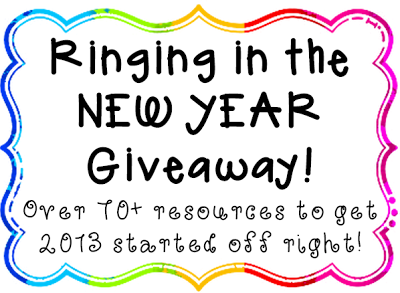 Liz at The Happy Teacher is also having a New Year GIVEAWAY!!!! You can WIN over 70 Teacher Resources to use with your students!!! WOW! That's a lot of materials! PLUS, you can also win a Starbucks Gift Card! You can enter 5 different giveaways! My donation is my Winter Addition with Doubles Game for Grades 1-3. It is in Giveaway #1. To take a peek at my donation, click on the picture directly above. To go to Liz's blog to see all the prizes and enter the GIVEAWAYS, click on the TOP picture. Here is a wonderful GIVEAWAY with over 60 Teaching Products that you can WIN! 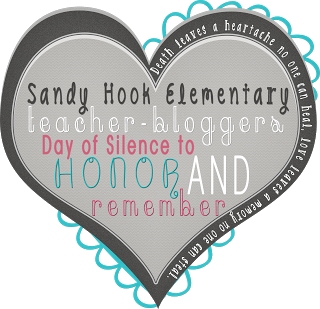 Jessica from Second Grade Nest is having the giveaway at her blog. She has divided the 65 teaching products into 5 giveaway. Check them all out and enter one or all five. My donation to the GIVEAWAY is in Giveaway #5. I have donated my Winter Addition with Doubles Math Center Game. To learn more about my donation click on the picture directly above. To go to Jessica's blog to see all the donations and to enter the giveaway, click on the top picture. Have fun! I hope you win lots of amazing new Teaching Products to use with your students. Here is a selection of fun, inexpensive, Christmas Tree crafts to make with the kids. Two of the trees are made with paper, one tree is made with yarn, one tree is made with ribbon, and one tree is made with rickrack. To get directions for the Christmas Trees pictured above, click on the appropriate link below. Have fun crafting for the holidays! Have you thought about making some handmade Christmas ornaments with the kids? Here are few that are fun and inexpensive to make. To get the directions for the different types of ornaments pictured above, just click on the appropriate link below. At this time of year the children are so focused on the holidays! Use that interest to try some activities that have a holiday theme and are also educational. A fun paper plate Holiday Clock can be made with the students then used to teach or review Telling Time or Elapsed Time. The Christmas clock pictured directly above was made with a plain red paper plate. 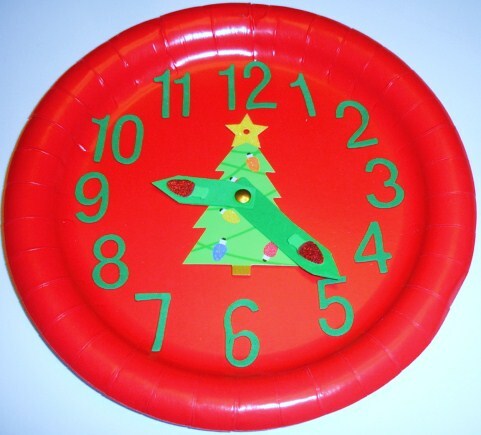 The tree in the middle of the plate is a paper gift tag that can be glued or fastened to the center of the plate to give the clock a festive look. Children can also design or color their own trees with drawing or construction paper and crayons. The clock hands are made from foam sheets purchased at a Dollar store. The foam clock numbers were also purchased at a Dollar Store (200 numbers in a package)! A package of paper fasteners was purchased at Staples. 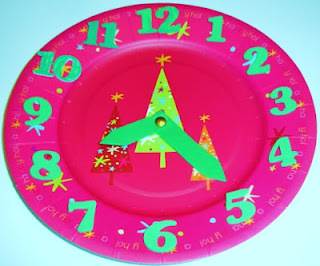 Have fun at Christmas Time learning about Time! I have another GIVEAWAY today! Teachers are being so generous this Christmas season and donating LOTS of their products this month for you to use with your children and/or students. This giveaway is brought to you by Being Inspired. You could win 40 different teaching products plus 2 cute Sock Monkeys!! Look at all the great teaching resources that you can win! My donation to the giveaway is my Ten-Frames Matching Game for students in PreK - Grades 1. To learn more about my Ten-Frames Activity, click on the above picture. To sign up for the GIVEAWAY, click on the top picture! 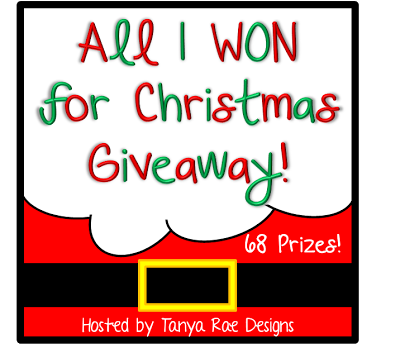 Tanya from Tanya Rae Designs is having a great GIVEAWAY of Teaching Resources on her blog. There are 68 prizes to win! I donated my Christmas Addition with Doubles Matching Game. To learn more about my game, click on the picture above! To view ALL the prizes that you can win and to enter the GIVEAWAY, click on the TOP Picture. Best of Luck! I hope you win lots of fabulous teaching resources and materials. It's time for another terrific GIVEAWAY! Joell at Totally Terrific Teaching is having a terrific giveaway. She actually has so many donations that she has 2 different giveaways. You can enter one or both!! I donated my Ten-Frames Matching Game which comes in both color and black + white. Click on the TEN-FRAMES GAME picture above to learn more about my product. Good Luck! I hope you WIN many, many terrific Teaching Products! Do you use 100 and 120 Number Charts with your students? If you do, here's a new Winter Themed 120 Chart that I just posted at my website. The graphic is from My Cute Graphics. Have you had snow yet this year? Here in New England, we had a light dusting the other night. It made everything look so beautiful especially the trees! This really is the time of year to start thinking of making some snowflake crafts with the kids. Here are 3 different snowflake craft activities that the kids might like to try. The first is made with paper or coffee filters. The second is made with cotton swabs, glitter, and glue. The 3rd snowflake is made with toilet paper rolls and pipe cleaners. To get the complete list of supplies and directions for each of the 3 snowflakes above, just click on the appropriate link below. You can also read my post about Robert Frost's book, Stopping by Woods on a Snowy Evening, here. Making crafts with kids at Christmas is soooo much fun! Here are 4 crafts made with LOTS of Heart Shapes. A few inexpensive supplies are needed for each craft. Here's a quick list! To get directions for each of the crafts pictured above, just click on the appropriate links below. Some Christmas music in the background might be good to add in! The holidays are almost here. Do your kids like to make their own cards? Here is a selection of 6 easy, fun, and inexpensive homemade (or school-made) Christmas Cards that kids can make. I usually use my 40% off coupons that I get in the newspaper, mail, or online to buy my supplies at craft stores.